St. Patrick’s Day is coming soon. So let’s have a drink! 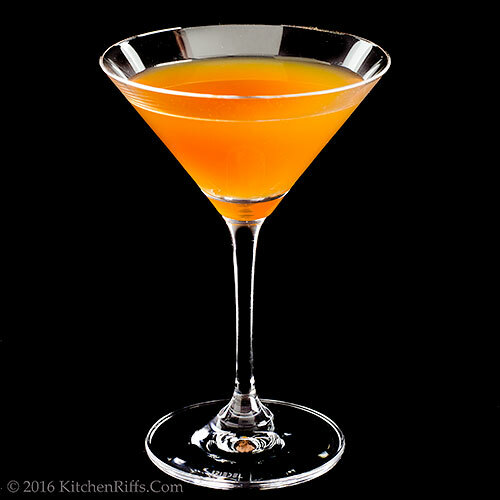 We can suggest the perfect tipple: The Hearn’s Cocktail, born at the original Waldorf Astoria hotel bar in New York City. New York was once home to thousands of Irish immigrants, so NYC bartenders knew how to handle Irish whiskey. Let’s all benefit from their knowledge, and get our Irish on. 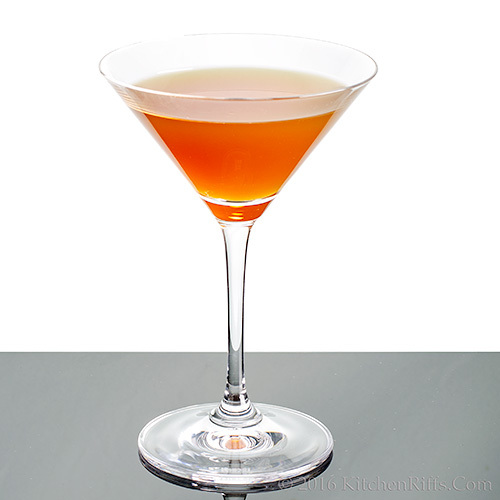 The Hearn’s Cocktail—sometimes called The Hearn Cocktail—originally called for equal parts Irish whiskey, sweet vermouth, and absinthe (or a pastis substitute like Pernod), plus a dash of bitters for zest. The result is a drink with heavy anise flavor. A bit too heavy for us, in fact, so we reduced the amount of absinthe in our version. Add all ingredients (except garnish) to a cocktail shaker half-filled with ice. Shake briskly until well chilled (about 20 seconds). Strain into a cocktail glass, preferably one that has been chilled. Garnish, if desired, and serve. Why shake rather than stir this drink? The “rule” says to stir drinks when all the ingredients are clear (because shaking introduces small bubbles, which can make a drink cloudy). But if some ingredients are opaque (citrus juice, for example), then you shake because the cloudiness won’t matter. In this drink, all the ingredients start out looking clear, but absinthe turns cloudy when mixed with other liquids. So you can shake this one. Or stir—it’s really your choice. This drink usually is served without garnish. But if you want to add one, we recommend a twist of orange peel. Feel free to adjust the amount of absinthe in this drink. As noted above, the original recipe called for a full ounce, but we found that overpowering. Some drinkers like to reduce the absinthe even further (using no more than ¼ ounce). This drink traditionally is served “up,” but we also like it on the rocks. When we make it that way, we sometimes increase the amount of absinthe (or pastis). The water from the ice cubes seems to dilute the anise flavor a bit. Absinthe was banned in the US (and much of Europe) for years because one of its ingredients was thought to be psychoactive and addictive. It’s legal again now–and usually quite high proof (100+). We often substitute Pernod (which is a brand of pastis) for absinthe because it’s good quality and widely available. Not to mention cheaper. There are other good brands of pastis available too. Ask the friendly people at your liquor store for recommendations. BTW, “pastis” is just the generic French name for anise-flavored liqueur that resembles absinthe. It’s generally good stuff. The Hearn’s Cocktail was invented at the original Waldorf Astoria hotel location, probably during the 1920s. So, who was Hearn? And why was this cocktail named after him (or her)? No one really knows. Around the time the drink was created, there was a popular department store in New York City called Hearn’s. Could the drink have been named after the store? Or one of its owners? Beats us. As is the case with so many cocktails, the history of this drink is murky. March 17th is the feast day of Saint Patrick, the best known of Ireland’s patron saints (the others are Saints Brigid and Columba). St. Patrick’s Day is celebrated by people of Irish descent around the world. And by those of us who decide to become Irish, at least for the day. “Or wake up face down in a field of shamrocks,” I said. Oh yes - this is the drink for me! I am a big fan of Jameson and all things Irish :) Love the color too! I could use a cocktail so this is perfect. I'm a big fan of whiskey so it sounds like a great drink! Hi Tricia, Jameson makes a rather nice whiskey, don't they? And the color on this is wonderful! :-) Thanks for the comment. Hi Laura, if you're a whiskey lover, this is the drink for you! Thanks for the comment. I'm not big on anise, either; I'll take your advice. I was lucky enough to visit the Jameon distillery last year. Can you believe it? I got a "certified whiskey tester" certificate! Frameable! That's a lot of fascinating history in one glassful! I'm used to Pernod and cold water as a Provencal summer cooler -- no ice, please, we're French, as they might say. So I can't get my head around this as a St.Patrick's day drink, especially since it's not green. But it sounds good. I have some Pernod because of an Ottolenghi recipe, but I don't keep most bar beverages on hand, so I'm not equipped to make it. Hi Rosemary, certified? Lucky you! :-) Thanks for the comment. Hi Louise, the Waldorf Astoria has a bar book in addition to the cookbook; the drink is in the 1935 edition (well, at least in my electronic reprint of it!). Thanks for the tip about Pam's! And thanks for the comment. Hi Mae, Pernod and water is a wonderful drink! Very refreshing. You'll find absinthe or Pernod in more drinks than you might think, but usually in fairly small quantities. Thanks for the comment. Hi Lizzy, isn't that a pretty drink? Really tasty, too, which is the important thing. :-) Thanks for the comment. What a beautiful drink John, love the color! Does it make a difference if I use Catholic or Protestant Irish Whisky? Or rather Bushmills or Jameson. Beautiful like a sunshine. Haapy St. Pat's day! Hi Cheri, isn't the color wonderful? And the flavor is, too! Thanks for the comment. Hi Anonymous, both "Catholic" and "Protestant" Irish whiskey works fine. You might say this is an ecumenical cocktail. :-) Thanks for the comment. Hi Denise, this is a sunny looking drink, isn't it? Good description! Thanks for the comment. I've never been much of a whisky drinker but if I were I'm sure I'd love this. What a gorgeous color! Hi Vicki, this is pretty enough that if you didn't like it, you'd have fun looking at it! :-) Thanks for the comment. Wowsers, I like a bit of Irish whiskey but I am huge fan of absinthe. Not something I have often but I love it. I am having a hard time imagining this combo so will have to make it to try. Thanks for sharing John! Oh my jeeze! St. Patty's day ALREEADDDYYY! Where the heck has the year gone! LOL! Such a pretty drink! Happy St. Patrick's Day! Hi Evelyne, the flavor of this is really interesting. We like it, a lot, but can see how someone who doesn't like anise wouldn't. But that doesn't sound like you. :-) Thanks for the comment. Hi GiGi, yeah, we're probably rushing the season a bit. But we wanted to give you plenty of time to get in the supplies for this. :-) Thanks for the comment. Hi Peachy, isn't this great? Thanks for the comment. We've had a ton of fun getting together with a couple who loves making cocktails. He even has his own martini kit he brings with him to share with the rest of us. 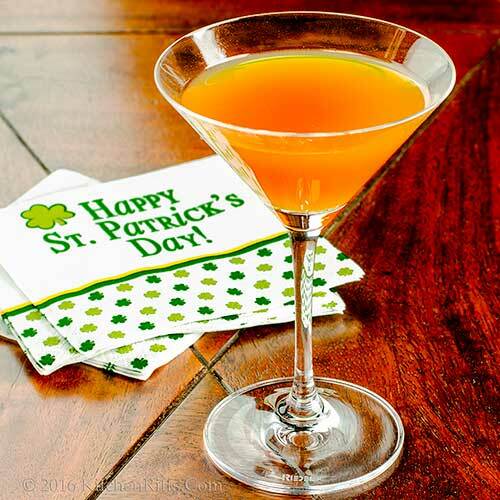 I'll definitely share this recipe with him so he can me this Irish drink for my hubby - mom is grew up in Dublin. Gosh! Another year has passed and St Pat day is here again! Thanks for introducing another fantastic drink to us! Hi Liz, green beer is kinda sorta fun, but I'd take a Hearn's too! Thanks for the comment. Hi Kushi, isn't this nice? And so tasty! Thanks for the comment. Hi Cathleen, we have more than a few drink recipes, don't we? :-) Thanks for the comment. Hi Kristi, wow, someone who brings his own martini kit! Very impressive. :-) Thanks for the comment. Hi Zoe, time really speeds along, doesn't it? Always enjoy St. Pat's day -- looking forward to this year's. :-) Thanks for the comment. 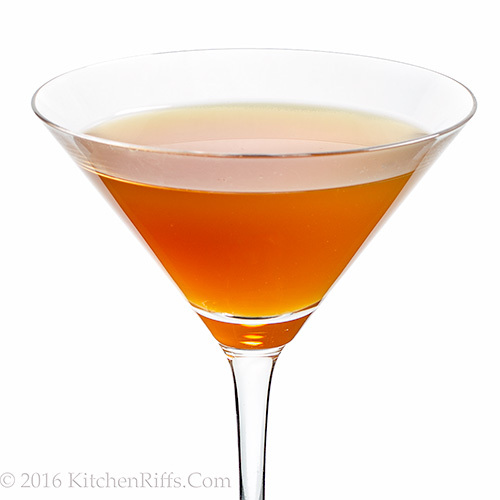 Hi Sue, this is actually somewhat similar to a Manhattan, but with absinthe. :-) Thanks for the comment. Oh I have a friend who would adore this! Love the orange color! Hi Ashley, we like the flavor, but the color is something else, isn't it? Thanks for the comment. I've actually had this relatively obscure cocktail and I agree...less absinthe. I'll have to try it on my own and test your recommendation...thanks! St Patrick's Day already- that's my daughter's birthday! It's amazing to think that a lot of the Irish immigrants first coming to New York spoke their own language and didn't understand English. Thanks for the heads up on this nice cocktail! Hi Barb, this isn't a common cocktail, is it? Pretty good, though -- although you do have to play with the absinthe quantity. At least we did. :-) Thanks for the comment. Hi Fran,doesn't time fly? Happy (early) birthday to your daughter! :-) Thanks for the comment. I quite like absinthe but it carries a kick for me so I need to be careful or I'd be dancing on the table. This is much better than green beer - and it's very pretty. Hi Greg, you can always start a new tradition in Nicaragua. :-) Thanks for the comment. Hi Maureen, absinthe tends to be pretty high proof, so it definitely delivers a kick. And isn't this pretty? Love its color! Thanks for the comment. hahaha that punch line though. Gotta love it--hope you two had a bottoms-up good time drinking this! Hi Ala, we had a good time with this drink. :-) Thanks for the comment. Gorgeous cocktail, John! I love the orange color. I bet it tastes good. Hi Holly, isn't the color great? A real stunner. :-) Thanks for the comment. I've never tried absinthe. This drink sounds potent and looks delicious! We really need to meet for cocktails sometime. I love your cocktail recipes, and really enjoy your notes. Hi Pam, if you like anise flavor, you'll probably like absinthe (the flavor is so strong it's always diluted with something else). If you don't, they you won't! :-) Thanks for the comment. Hi Jeff, sounds like fun! Thanks for that very kind comment. I can see why you would reduce the amount of absinthe. That stuff is POTENT. A little goes a long way. And I bet a little bit of the green fairy would be wonderful in such a cocktail. Sounds like it has some real punch to it! Hi Carolyn, absinthe is pretty powerful stuff, isn't it? Good, though. :-) Thanks for the comment. Hi Dana, practice makes perfect, you know, so making this tonight is a terrific idea. :-) Thanks for the comment. Hi Mary, it does have some heft. Although it's a fairly small drink in terms of volume. So don't have too many! Thanks for the comment. Great pictures as usual :), happy SP day. Hi Amira, :-) Thanks so much for that kind comment. That color is just too pretty for words. Yes, this definitely beats green beer! Hi Chris, the flavor of this drink is good, but this is one case where the color is better. :-) Thanks for the comment. Hi Debra, green beer is fun when you're a kid, but its charm does disappear, doesn't it? Thanks for the comment. A great precursor to St. Patrick's Day. No wonder Irish eyes are smiling! Hi Anne, I'd try a pastis (like Pernod) first, before trying absinthe. We DO use absinthe, but use a pastis much more often. Thanks for the comment. Hi Beth, always enjoy St. Patrick's Day! Particularly the food and drink associated with it. :-) Thanks for the comment. Hi MJ, tons of flavor. Tons. :-) Thanks for the comment. Hi SG, it is, it is. :-) Thanks for the comment. Cheers to you John and Mrs Riff! I think that the Irish got it right when it comes to drinks. I think I would only need one and I would be looking for 4 leaved shamrocks in fields...Delicious and beautifully photographed. Sharing! Whiskey cocktail...sounds delicious...and look so elegant, indeed perfect for St. Patrick's. Hi Bam, one of these is really enough. Two at the most. :-) Thanks for the comment. Hi Juliana, don't you just love whiskey in cocktails? We sure do! And Irish whiskey always seems especially nice. Thanks for the comment. Hi Julie, this is a good one! And it's never to early. :-) Thanks for the comment. Hi Pamela, we love the color of this! And the flavor too, of course. :-) Thanks for the comment. I adore your notes and history behind your drinks, so fascinating. That is such a gorgeous drink. Love it. Hi Asha, this really is a pretty drink, isn't it? Lovely to sip, too! :-) Thanks for the comment. I love the color of this drink. It sounds like it will be perfect for St. Patrick's Day. Thanks for sharing! Hi Dawn, isn't the color terrific? Such a fun drink! Thanks for the comment. Hi Pirya, this is a good one! Your hubby will like it, a lot. :-) Thanks for the comment. I love coming here for cocktail hour. And I have a vague recollection of a Hearns Department store in NYC.... so I am eligible to drink this. Happy St. Patrick's Day! Even if this does make me wake up in a field of shamrocks. Hi Claudia, sometimes waking up in a field of shamrocks in a good thing! :-) Thanks for the comment. Hi Terra, fun drink -- definitely worth a try sometime. Heck, it's still basically St. Pat's, so try it this weekend. :-) Thanks for the comment.